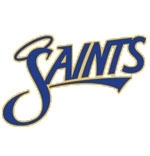 NORMAL – University High’s top seeded Volleyball team swept Central Catholic in two games of the Class 3A Regional the Saints hosted Tuesday, earning a shot at the event’s championship. The Pioneers advanced to Thursday’s championship match by beating 7th seed BCC with scores of 26-24 and 25-18. The Pioneers will take on Manteno Thursday night. Manteno swept Fairbury Prairie Central by scores of 30-28 and 25-14. U-High Takes Game One, 26-24: In game one, the top seed Pioneers and 7th seed Saints matched each other point for point until U-High pulled away thanks to a pair of kills – one by Alyanna Crabtree and one by Jess McDowell – to pull in front, 18-14, prompting BCC head coach Teresa Ulrich to call a timeout. Following the timeout, a Pioneers driving the ball into the net followed by a kill by senior middle hitter Morgan Koch cut the Pioneers’ lead to two, 19-17. Saints sophomore outside hitter Abby Cox delivered two serves which proved problematic for U-High, the first was shot into the net while the second fell short of it, allowing BCC to tie the game at 20-20, prompting Pioneers head coach Michael Bolhuis to call timeout. The game would tie two more times, at 22-all and 24-all before U-High would overcome serves by Saints senior outside hitter Mallory Bergbower to take the first contest. Pioneers Overcome Saints’ Streaks In Game Two, 25-18: University High struggled through the first part of the second game, leading briefly, 2-1 before BCC tied the game at 2-all, and with Cox serving, went on a four-point unanswered streak, taking a 6-2 lead until a Pioneers kill cut that lead, 6-3. U-High crept into an 8-all tie before a kill by junior setter Isobel Schaefbauer helped give them a one-point lead, 9-8, which they stretched into a 10-8 lead forcing BCC head coach Teresa Ulrich to take a timeout. From there, the score would be tied once more at 10-all, but with junior outside hitter Alayna Crabtree and junior defensive specialist Skyler Jenkins serving, the Pioneers were able to advance to an 18-11 advantage. A kill each from Saints junior defensive specialist Ellie Nelson and U-High’s Tongate pushed U-High into a 22-15 lead. Crabtree, with her team up, 24-18, delivered U-High’s last serve which BCC returned but failed to keep in bounds leading to the final score, giving the Pioneers a sweep and a shot at the Regional crown provided they won against Manteno. The victory advances U-High’s record going into the Regional Championship at 27-7. BCC’s season ends with a 21-15 record. Crabtree registered 6 kills while McDowell had 5 for U-High. McDowell also served three aces. Their teammate, senior setter Macy Tongate had 12 assists and three blocks. Junior defensive specialist Logan Murray had 4 digs. While BCC had no aces, Cox scored 10 service points. Bergbower had 9 kills, followed by 7 from senior middle hitter Morgan Koch. Junior setter Kate Moorman-Wolfe lent 22 assists and had one block. Bergbower also had a block. Senior middle blocker Lauren O’Donnell had 9 digs followed by junior defensive specialist Sydney Adams’ 8. “We knew BCC would try sending the ball to senior middle hitter Morgan Koch when they could and we didn’t do a very good job of slowing her down at all,” U-High’s Bolhuis said. “It was neck-and-neck, and kind of a high tension match all the way through,” Bolhuis said, giving credit to the seniors on his team with using their experience to get their team through the match and overcoming moments when they trailed. BLOOMINGTON – Normal Community High School senior quarterback Daylen Boddie scored four running touchdowns totaling 80 yards and threw over 200 yards passing as the visiting Ironmen defeated Bloomington High School at Fred Carlton Field Friday night, outpacing the Purple Raiders, 49-28, for a Big 12 Conference victory. BHS (4-2 overall, 3-2 Big 12) could only mount single-digit scoring each quarter but surprised their fans and stunned the visitors when senior wide receiver Drew Crooks took the contest’s opening kickoff at his own 13 yard line and then weaved his way through Ironmen defenders and then found a hole in the defense which he used to score the game’s first points. That gave BHS a quick 7-0 lead at 11:48 in the first quarter following freshman kicker Jack Weltha’s extra point. After each team failed to score on a possession and BHS punted, NCHS (5-0 Big 12, 5-1 overall) and Boddie received the ball at his team’s own 46. From there, he weaved through defenders for his team’s first score of the game followed by senior kicker Camron Hinman’s extra point to tie the game, 7-all, with 5:35 left in the quarter. Boddie scored his next touchdown from five yards out with 55.2 seconds left in the quarter followed by Hinman’s extra point, putting the Ironmen up, 14-7. Junior running back Jake Hileman scored from five yards out to cap a 3-play, 53 yard drive for NCHS putting the Ironmen up, 21-7, following Hinman’s extra point at 3:56 in the second quarter. BHS’ ensuing drive resulted in a 6 yard touchdown pass from senior quarterback Griffin Moore to junior wide receiver Diontay Griffin with 47.5 seconds until halftime capping an 8 play, 64 yard drive. A 2-point conversion pass from senior wide receiver C. J. Hyde to junior wide receiver Ivan Smith provided a surprise for fans and cut NCHS’ halftime lead to 21-15. NCHS received the ball after the half and marched 65 yards on 7 plays for their next score, a 26 yard pass from Boddie to senior wide receiver Connor Lay at 9:14 in the third quarter followed by Hinman’s extra point, increasing the Ironmen’s margin, 28-15. Following a BHS punt, the Ironmen scored again, with Boddie running into the end zone from 14 yards out to put the visitors up, 35-15, after Hinman’s next extra point at 6:07 in the quarter. BHS pulled within 13, 35-22, when Moore connected with senior wide receiver Mauliek Johnson on a 22-yard pass play followed by Weltha’s next extra point, with 3:42 remaining in the third quarter. But NCHS increased their lead by 20, 42-22, at 11:31 in the fourth quarter when Boddie connected with senior wide receiver Dishon Hall II on a 20 yard scoring pass followed by Hinman’s extra point. Starting with an interception of a Bloomington pass by Ironmen Hall playing defensive back, NCHS began their next drive at the Purple Raiders’ 16. Three plays later, Boddie scored from seven yards out to top the drive, followed by Hinman’s extra point, with 8:16 left, pushing the Ironmen up, 49-22. BHS scored their last points of the night thanks to Smith’s 19 yard running touchdown with 5:58 remaining in the contest but Weltha missing the extra point. Referring to the contest overall, Drengwitz said, “ Bloomington was doing some things we had to adjust to and they were playing physical and their assignments were sound.” He said his team put itself behind in a couple instances but were still able to come away with a win. This contest, BHS head coach Scott Godfrey said afterward, is “why our guys need to be in the weight room. NCHS was more physical than us and they took the fight to us in the second half. That Normal Community team is bigger and more physical than we are. “We knew at some point we would have to match score-for-score with them,” Godfrey pointed out. “We told our guys ‘you have to keep going against this team,’” explaining to his players that NCHS has the ability to run away from opponents during contests. NORMAL – Normal Community West High School stunned undefeated Bloomington High School in the first quarter of their Big 12 Conference contest by scoring 10 unanswered points in the opening quarter while their defense managed to hold the Purple Raiders scoreless in the first and fourth quarters en route to a 17-14 victory before roughly 1,500 fans at Wildcat Field Friday night. Part of the credit for BHS’ remaining scoreless in the last stanza needed to go to junior defensive back Gavin Tellor, who dove to make an interception at Normal West’s 9 yard line with 44 seconds left in the game, staving off a potential victory by the visiting squad. BHS (3-1 overall, 2-1 Big 12) saw their first possession of the contest end in a turnover of the ball to the Wildcats on downs at West’s 12 yard line. From there, the home team marched 88 yards on 12 plays ending in a Theobald 25 yard field goal, increasing West’s advantage, 10-0, with 14.7 seconds left in the opening quarter. BHS got on the scoreboard thanks to senior quarterback’s first faking left before going up the middle for a 1 yard running touchdown at 3:14 in the second quarter followed by freshman kicker Jack Weltha’s extra point. That allowed Normal West to hold a 10-7 edge going into halftime, and to receive the ball to start the second half. BHS opened the third quarter by holding the ball for nearly six minutes as they marched down field toward a concluding 2-yard scoring run by senior running back Holden Snyder at the 6:31 mark. That was followed by Weltha’s extra point, putting the Purple Raiders in front, 14-10. It was a lead that would stay in place going into the fourth quarter. BHS was a minute and three seconds into their drive when the fourth quarter began from their own 11 yard line but three consecutive flags against the Purple Raiders and an incompletion forced them to punt the ball back to Normal West, where they began their next drive from their own 11. Thirteen plays later, sophomore wide receiver DeAris McQuirter scored from 8 yards out, capping an 89 yard march for a touchdown, putting Normal West in front, 17-14, following Theobald’s extra point. As to how the Purple Raiders handled his team, Fincham said he had to credit BHS with “made some adjustments and were double- and triple-teaming Armani at times, so other people made plays,” referring to senior wide receiver Armani Forrest. “If you hold Normal West to 17 points, you’re supposed to win,” said first season BHS head coach Scott Godfrey. “We settled down after that first drive or two after we got used to seeing their no huddle and hurry up. I think our defense settled in and I couldn’t ask anything more from them. NORMAL – Prior to the start of Normal Community High School’s game against Bloomington High School at Ironmen Field Friday, both teams were notched on top of the Big 12 Conference standings having won their individual Week 1 games. But after their head-to head showdown, it was the Ironmen who remained undefeated, having thrilled a home crowd with a 54-30 victory. The win gave the Ironmen a 2-0 record overall, which included in the Big 12 Conference standings. The first half was highlighted by three key NCHS drives for the scores. The first being junior quarterback Daylen Boddie’s dash for a 73 yard touchdown followed by an extra point try by junior kicker Josue Nsukami, giving the Ironmen a quick 7-0 lead. That was followed by a 45 yard scoring run by senior running back Varshaun Dixon after which Nsukami missed the extra point, upping the lead to 13-0. Later in the same quarter, Bloomington got on the scoreboard with an 85 yard kickoff return by junior wide receiver Drew Crooks, but missed the point after, cutting NCHS’ lead, 13-6. Boddie would counter with a 43 yard scoring dash to complete the Ironmen’s next possession, putting NCHS up, 20-6, after Nsukami’s next extra point. There would be one more score before another large scoring march took place courtesy of Dixon, dashing 53 yards for a touchdown, followed by another Nsukami kick, putting NCHS up, 34-6 at 8:48 in the second quarter. Senior running back C. J. Chastain’s 94 yard interception return for a touchdown at 3:37 in the second quarter, followed up by a missed Nsukami extra point would give NCHS a 40-6 lead with 3:30 left until halftime. A 10-yard scoring pass from senior quarterback Colton Sandage to junior wide receiver Griffen Kolic cut NCHS’ lead, 40-12 by halftime, following a failed BHS 2-point scoring run try. NCHS senior wide receiver Jalen Coleman’s 43 yard scoring dash four plays into the third quarter, followed by junior Camron Hinman’s extra point, pushed NCHS up, 47-12 with 11:31 left in the quarter. As a result of their being a 30-point difference in the score, game officials were required to employ a continuously running clock, stopping it only for team timeouts or injury timeouts. An interception halted the next drive for BHS (1-1 overall and Big 12 Conference), and placed the ball on the Purple Raiders’ 13 yard line. From there, Boddie ran for NCHS’ next score at 9:26 in the third quarter followed by Nuskami’s next extra point. That allowed NCHS’s lead to climb to 54-12. But that turned out to be the final points the Ironmen would score in the game. The Purple Raiders would score once to close out the third quarter as Sandage scored from one yard out, 54-18, followed by a failed 2-point attempt at the 1:03 mark. Sandage scored from 7 yards out at 4:35 in the fourth quarter, but a 2-point conversion failed, although it did slice NCHS’ lead to 54-24. The Purple Raiders’ last score of the night was a 47 yard touchdown pass from Sandage to senior wide receiver James Ellis in the closing minutes of the contest, followed by a failed 2-point try, resulting in the final score. “What hurts the most is the feeling you could have beat them,” lamented BHS head coach Joe Walters. He added interceptions Sandage threw early in the game may have rattled the 6 foot-2, 195 pound senior quarterback. NORMAL – Driving rain passed through the area as Normal Community West High School tried to get back on track against Big 12 Conference rival Bloomington High at Wildcat Field Sept. 30, but both sides seemed undeterred in their efforts to improve on their season’s record in the process. Despite the soggy conditions, Normal West prevailed, winning their homecoming contest, 41-36, as roughly 800 fans divided equally in terms of their loyalties, watched. Junior running back Genesis Forrest scored the game’s only first quarter touchdown for Normal West (2-4, 2-3 Big 12) at the 6:39 mark, taking in a 16 yard pass from senior quarterback Peyton Dillingham, putting the Wildcats on the scoreboard first, 7-0, following junior kicker Matt Lage’s extra point. After West defenders prevented a Purple Raiders drive from getting beyond their own 6 yard line, Forrest extended his team’s lead taking a BHS punt 69 yards into the end zone at the 9:34 mark in the second quarter to give West a 14-0 following Lage’s next extra point. On the next series for BHS, the Purple Raiders scored as senior running back Domineik Criddell ran into the end zone from 8 yards out, followed by a successful point after by junior quarterback and kicker Colton Sandage, slicing West’s lead in half, 14-7, at the quarter’s 8:59 mark. Normal West’s next series of downs ended in a sack by BHS defenders of Dillingham at West’s 28 yard line. Three plays later, Sandage connected with senior wide receiver Avery Lyons from 8 yards out for another touchdown, tying the game at 14-14 following Sandage’s next extra point. A 23 yard touchdown pass from Sandage to Criddell pushed the Purple Raiders into the lead for the first time in the contest at 3:36 in the quarter, 20-14, but Sandage missed the extra point. It was a very brief lead though as, on the ensuing kickoff, Wildcats sophomore running back Armani Forrest took the ensuing kickoff 88 yards, dashing through defenders’ blocks and tackles, reaching the end zone, followed by Lage’s extra point to give West a 21-20 lead going into halftime. West won the pregame coin flip and deferred to receive the ball to start the second half, but a fumble gave BHS the ball, allowing them to score two plays into the third quarter thanks to a 15 yard touchdown run by Criddell, followed by Sandage’s extra point putting the Purple Raiders up, 27-21 at the quarter’s 10:59 mark. Each team had one series of downs that resulted in a punt before the next score came courtesy of Genesis Forrest who took West into the end zone on an 80 yard dash, followed by another Lage point after, allowing the Wildcats a one-point lead, 28-27, with 3:02 left in the third quarter. West closed out the third quarter scoring at the 2:24 mark as junior wide receiver Greg Thomas’ 24 yard touchdown pass from Dillingham pushed West in front, 34-27, but Lage missed the extra point. BHS knotted the game at 34-all with a 12 yard rushing touchdown from junior running back Sam Warren with 6:41 left in the contest, followed by another Sandage extra point. But West next scoring opportunity came at the end of the next series of downs finishing with a 1 yd. touchdown run from junior running back Malik Tucker at the 5:37 mark, giving West a 41-34 lead. BHS tried one more time to advance the ball but had to punt, forcing West to work deep in their own territory. With time and space to work going against the Wildcats, BHS’ defensive unit members were able to force Dillingham out of the back of their own end zone scoring a safety resulting in the final score.